Sometimes less alcohol goes a long way. Imagine sitting by the pool or enjoying a spring picnic with some cool white wine in the GoVino or plastic wine glass. Less alcohol will allow you to enjoy this scene a bit longer — lingering over tasty snacks or ogling the people at the pool. Kinda dreamy, huh? 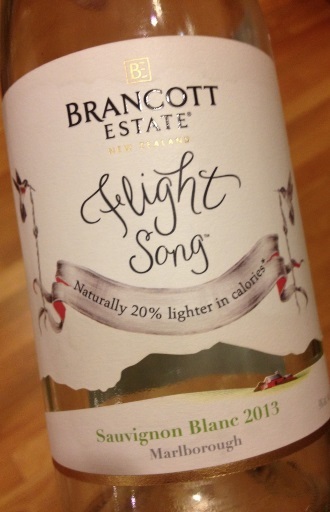 Brancott Estates, known for their New Zealand Sauvignon Blancs, has launched a new line of wines called Flight Song, pimping them as having 20% less calories (than their other wines). And lower alcohol. About 4% less alcohol actually, weighing in a 9%. The difference mainly stems from an early grape harvest when the grapes haven’t formed all their sugar yet. And less sugar in the grapes = lower alcohol (thus lower calories). There are myriad reasons why this is a good thing, but the best is that you can slurp your way through an entire bottle and not feel too woozy or pass out in the warm sun. Both of these wines are tremendously easy to quaff, with some sweetness that is nicely balanced by the higher acidity present on the tongue. They feel almost tingly… in a good way. The 2013 Flight Song Sauvignon Blanc was my favorite of the two, yet both have their place in someone’s heart. And at $15, that could be just about anyone. The fairly dry Sauvignon Blanc is loaded with tart grapefruit, lemon-lime, passionfruit and lemongrass, finishing with a zesty lime rind finish. Sweetness= 2 out of 10; Price: $15; available at retail stores nationwide; pair with seafood in citrus sauces, fresh goat cheeses, Brown Rice Salad with Chicken. 2013 Flight Song Pinot Grigio has tart citrus, apple and pear on the palate and then finishes strong with grapefruit, and lime rind. It’s sweeter than the Sauvignon Blanc but the acidity balances it out. This is a very versatile spring and summer sipper for sure. Patio punch. SW= 3 out of 10; Price: $15; Available at retail stores nationwide; pair with spicy Thai or Indian food, Lemon and Herb Roast Chicken, or Caribbean Jerk Chicken. See more about these wines on the pretty cool Brancott website.